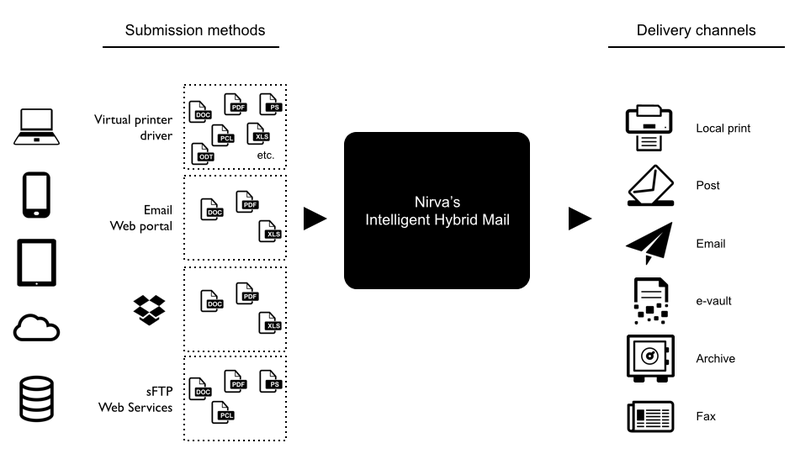 What is intelligent hybrid mail? Intelligent Hybrid Mail allows you to securely and extremely simply send documents from a business application, PC, Mac, smartphone or tablet and have it mailed locally or internationally, electronically sent or secured into an e-vault, depending on the sender's request or the type of document sent. If you are a private or public organisation of small to large size, a software vendor, an e-delivery / print service provider, or a print & mail solutions reseller, you will benefit from our solutions. Our clients include prestigious print service providers, banks, insurance companies, utilities, industries, retailers, cities, ministries, and numerous small to medium size, unknown ones, but now extremely efficient. What benefits do our clients reach? The benefits vary depending upon your vision, your type of organisation, the amount of mail items you currently send, your processes. However, our existing users have all improved the security of their mailing and e-delivery processes, the productivity of their employees, the quality of their communication, and of course dramatically reduced their costs related to communication. a managed SaaS model (to large organisations, print or e-delivery service providers).